Coptis japonica is widely distributed in Japan, and its dried rhizome is a source of the domestic herbal medicine Coptidis Rhizoma (黄連 Oren). There are three varieties of C. japonica, two of which, namely, C. japonica var. anemonifolia and C. japonica var. 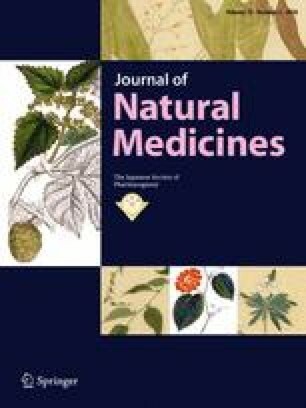 major, are important as sources of traditional medicines. Coptis japonica var. anemonifolia and C. japonica var. major are distinguishable on the basis of their ternate or biternate compound leaves, respectively. In the Hokuriku area, where both C. japonica var. anemonifolia and C. japonica var. major grow naturally, some individual plants cannot be identified unambiguously on the basis of leaf morphology because changes in leaf morphology may occur due to intra-variety variation or crossbreeding between the two varieties. In addition, genetic differences between the two varieties have remained unclear. In this study, we employed new genetic and morphological classification approaches to discriminate between the two varieties. Based on the single nucleotide polymorphisms of the tetrahydroberberine oxidase gene, we found four conserved SNPs between the two varieties and were able to classify C. japonica into two varieties and crossbreeds. Furthermore, we introduced a new leaf type index based on the overall degree of leaflet dissection calculated by surface area of a leaflet and length of leaflet margin and petiolule. Using our new index we were able to discriminate between the two varieties and their crossbreeds more accurately than is possible with the conventional discrimination method. Our genetic and morphological classification methods may be used as novel benchmarks to discriminate between the two varieties and their crossbreeds. The online version of this article ( https://doi.org/10.1007/s11418-018-1179-9) contains supplementary material, which is available to authorized users. We are grateful to Ms. Kazumi Fukuhara, Mr. Naomi Kuwahata, and Mr. Yoshiaki Kato for kindly providing samples of C. japonica. We also thank Dr. Kozo Fukuda for providing useful information.